It’s been a while – some fifty years in fact – since Enid Blyton took her most famous troupe The Famous Five for one last bicycle ride to that hidden shoreline cove, where doubtless they would’ve happened upon some casual piracy, ship wrecking or kidnapping. In a manner that would certainly intrigue modern social services, the Five righted wrongs and brought all manner of dastardly villains to heel. Now the Five are back in the biggest humour hit series of the season. Riding on the nostalgia-shredding coat-tails of Ladybird for Grown-Ups, the must-have gift from last year, our friends at Quercus present Enid Blyton for Grown-Ups, the hilarious continued adventures of everyone’s favourite over-zealous do-gooders. It’s the Five, all right, but it’s the Five now armed with driving licences and children, fully grown and completely at odds with a baffling modern world. 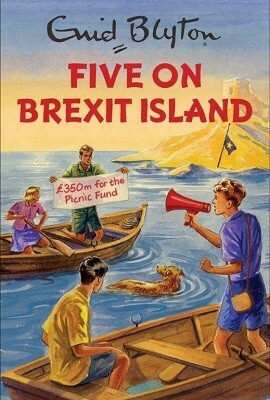 In no particular order, we offer Five Go Parenting, Five Go Gluten Free, Five Go on a Strategy Away Day, Five Give Up the Booze and the essential Five on Brexit Island, the moment our quintet declare independence for Kirrin Island. But can their friendship survive the horrors of a referendum? We love these titles and in our eagerness to share, all five are available at Waterstones.com at a princely 25% off, making your first choice around what to buy this Christmas a tad easier. Of course, you’ll need to get eccentric old Uncle Quentin something else, as he’s in the books already!